Genus summary: The genus Agapostemon (ag-uh-PAHST-eh-mon) is widespread and abundant throughout North America, with approximately 40 species in total and five species in California. They are most diverse and abundant in temperate regions and southwestern U.S. deserts. Agapostemon are commonly called “sweat bees” because they are closely related to, and resemble bees in the Halictus and Lasioglossum genera. Unlike those bees however, Agapostemon, are not attracted to human sweat. Key: Species of Agapostemon key. Description: Agapostemon are brightly colored metallic green or blue bees. They are medium sized ranging from 0.3 to 0.6 inches (7 to 14.5 mm) long. Most species have a bright metallic green head and thorax, and a black-and-yellow striped abdomen; some females are entirely bright green or blue. Females carry pollen on scopal hairs located on their hind legs. Female Agapostemon are relatively fast-flying bees. Males fly much more slowly because they are often searching flowers for females. Under a microscope, you would look for a shield like indentation on the abdomen to confirm that a large bright green bee is an Agapostemon and the face of the propodeum on the thorax is completely encircled by a clearly raised line. 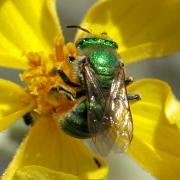 Similar insects: Osmia species can also be metallic green, but are more robust and carry pollen on the underside of the abdomen instead of on the hind legs. Some cuckoo wasps also look similar to Agapostemon. Food sources: Agapostemon are generalists. Like other members of the family Halictidae, they are short-tongued and thus have difficulty extracting nectar from deep flowers. Males can be observed flying slowly around flowers looking for females. Nests: Agapostemon dig deep vertical burrows in flat or sloping soil, or sometimes in banks. Most species are solitary, but some species nest communally. Up to two dozen females may share a single nest entrance, but each individual builds and provisions its own cluster of brood cells. Where a communal nest gallery shares a single entrance, one bee usually guards the hole, with only her head visible from above ground.